Even from the relative safety of Row K, back in the civilian zone, I could feel the spray of the blood. I think next time we might just sit in the splatter zone. Now I love plays, and generally I love the witty wordy ones that delve deeply into the psyche and leave me pondering the human condition. That's not exactly what I saw last night. Evil Dead: the Musical is pretty much the complete opposite of that. But I have to say, it was the most fun I have ever had at the theatre. It's a campy, over-the-top, cheesy, raunchy production and the entire audience loved it. After reading the prominently posted Splatter Zone Rules, we entered Ground Zero Theatre to the caterwaulings of Pat Benatar telling us that hell is for children. I think at the very least we should have taken that as a sign of things to come. Obviously some people were very well prepared. I spotted people dressed in garbage bag shirts making their way into their seats in the Splatter Zone. I suspect some of them have seen the play before. I have watched clips from other productions of this play, and, while I realise that much is lost in translation, I must say that the Ground Zero Theatre production looks like one of the best ones on offer. First off, the set is great. From the cutout car in which the five college students are making their way to the cottage in the woods during spring break, to the cottage proper in which everything from the kitchen cupboard doors to the mounted moose head becomes animated and malevolent, the entire stage comes across like a really great haunted house ride at the fair. There are catchy songs and there is doomed romance; there are evil spirits and there are forests which commit sexual interference. And by god there are dance numbers. A little bit Rocky Horror Picture Show, a little bit Canadian Blood Services promotional videos, Evil Dead: the Musical gives you some soft shoe, some shimmy, some come on big boy, I dare you to touch me there. If you get a chance to see this production, somewhere in the world, do see it. If you really want the complete experience, by all means be prepared to sit in the Splatter Zone and have the zombie demons work their way past your row where they slap you senseless with their dripping intestines. And when the chainsaw gets fired up and the body parts start flying, be prepared to be a critical part of the crimson shower. Or be a scaredy cat like me and sit in the civilian seats and live vicariously through the characters onstage and through those in the first few rows. Either way, you will have a bloody good time. Is that when it really hurts? "A little bit Rocky Horror Picture Show, a little bit Canadian Blood Services promotional videos" - this line killed me! I'm not a live theatre type - I don't "get" it at all - but this looks like more my cup of tea. The original Evil Dead was filmed about an hour from where I live. I'd so be in the splatter zone. Nice font colour choice, btw. And my word verification is "glygdom." I told my son about your weekend adventures to which he promptly surmised. "Dad YOU are sooooo boring..."
He is so right. The Zombie Clan ain't got nothin' on me! What a terrific way to spend a night! Glad you had fun. Sounds like a fabulous night at the theatre if you ask me. 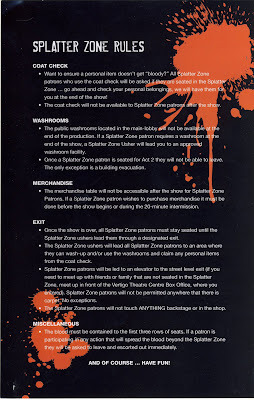 I got a kick out of the splatter zone rules, "Coat check will not be available after the show to those in the splatter zone." Ha! Even the several rows of seats behind the splatter zone were covered with plastic, Urban Blonde. I think you should be quite safe and dry in row T though, unless of course I stand up and start hucking stuff at you from the splatter zone. This is how they first draw you in, Wandering Coyote, with zombies and blood baths. Next thing you know, you will be going to see Cats. How very cool is that, Dr M? Please tell me you got to be an extra in it, because you would rock those scenes. Hi and welcome, Michele. Wasn't it the most fun you've had in a long time? I didn't realize there was a cross-promotion at the blood donation centre, though. Inspired idea! With a centrifuge, perhaps, Charlies? Now you've got me pondering that. If you get a chance to see a production, you must! Thank you for noticing my dried blood font colour, John. I consider it to be a fashion statement. I'm sure he was just referring to your choice of friends, Sean. I still think you folks should have hopped on a plane and joined us at the show, though. We spotted a big bloody hand print on the wall on the way out of the theatre, Al, so I think somebody was bending the rules a bit. According to the rules Mz Zombie if you did stand up and start hucking stuff you would be swiftly escorted out of the building. Now that WOULD be WORTH the price of admission! But all joking aside, I think I too would be sitting in the back where I wouldn't get drenched in fake blood. Maybe after sitting through it once and seeing how much you would have to endure, maybe, just maybe then I would sit down front. You would enjoy that, wouldn't you, Urban Blonde? I'd be dragged out "yelling up against the wall, pigs", you'd be falling off your chair laughing. It seemed like the first 3 rows were the ones that got the lion's share of the gore, Todd. I think one could still sit in the back seats of the splatter zone, thus gaining bragging rights, but remaining mostly dry. I would love to see a play with you - any play. Me too, Gifted! It would be a meeting of the mutual admiration society. I am a fan of Evil Dead the Musical. I saw it 12 times in Toronto between 2007 - 2008. Evil Dead was a great show in both Calgary and Toronto.